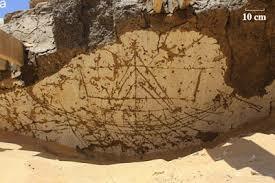 An ancient tableau depicting images of boats has been uncovered in a building dating back nearly 4,000 years. The carvings, which number more than 120, have been re-discovered on the walls of a structure in Abydos, southern Egypt – the same site where the tomb of pharaoh Senwosret III came to light more than 100 years ago. Associate Professor in Egyptology at the University of Pennsylvania Josef Wegner is leading the team excavating the site. Writing in the International Journal of Nautical Archaeology, Wegner said the remains of an actual boat, buried alongside the tomb, have also been detected. Carved onto white plaster walls, the intricate images extend for 82ft (25 meters) and include depictions of sails, masts and oars. More rudimentary representations of animals are also present. "Some individuals appear to have been more talented or interested in rendering the fuller details of Egyptian watercraft, while others were content to leave only a token stroke evoking the basic curvature of a boat hull", Wegner writes. This is the first time since 1903 that the carvings have been seen in person. Archaeologist Arthur Weigall spied the images briefly while excavating the tomb of Senwosret III – before its roof caved in. “The roof was barrel shaped, and some of it was still standing until excavated, when it fell in. Upon the whitewashed walls of the burial chamber a number of drawings of boats had been scratched in later times, some of which are of interest,” said Weigall at the time. The University of Pennsylvania Museum's Egyptian department has been excavating at the mortuary complex of Senwosret III – one of the largest royal tombs ever built in ancient Egypt – for over 20 years and has been examining the general Abydos site for more than 30 years.